Throughout the history of the company, apprenticeships have been embedded within the way we operate. The Morson apprenticeship model has been successful in helping us recruit and nurture talent from entry level upwards. Our apprenticeship programme offers training and development right up to senior management level: Morson's first ever apprentice, taken on in 1980, is now our client services director with almost 40 years of service across the business. 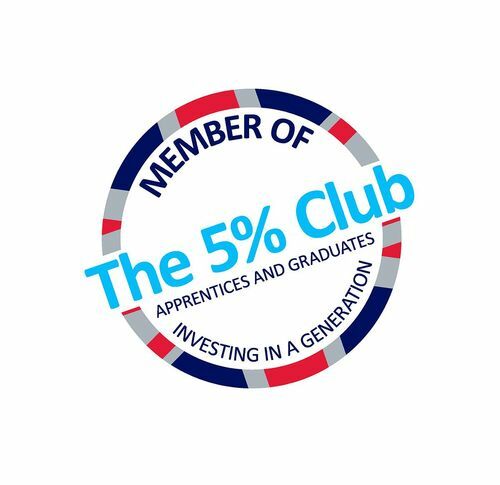 Morson Group are proud to be a member of the 5% Club Charter for Apprentices. The charter is an industry-led initiative focused on promoting the recruitment of apprentices in the workplace, with the ultimate goal being to have at least 5% of the workforce in the business enrolled through various ‘earn and learn’ schemes. The organisation aims to achieve positive results from both a business and social point of view by address the growing skills gap in the country as well as tackling youth unemployment. Through joining the club, Morson pledge to maintain a minimum of 5% of our workforce enrolled in apprenticeship schemes at any time across the business. We believe that by joining the 5% club we will play a role in Britain’s long term prosperity, benefitting business and society alike, and aim to both encourage and work with other businesses to participate in the campaign. Morson are also taking active steps to promote conversations across the industry surrounding the importance of apprenticeships. In January 2018 we are hosting a HS2 roundtable event where key rail suppliers will discuss the opportunities to develop new solutions, particularly with apprentices and how we can use the Apprenticeship Levy to its best advantage. The roundtable will also include presentations to share insights, learnings and best practice from key figureheads at HS2 Ltd, the National Skills Academy for Rail and Network Rail.